Today I returned to the dragon boat. I've been training with my team since January and this has been great. We've been doing circuit training and core work and strength training. I love the team; we have a few new paddlers who are awesome - and most of last year's team is back. We are a cohesive team and we get along well; it is a great season so far and this coming Tuesday we take it to the water. Today, though, I attended the Awakening of the Dragons ceremony. This is done by monks, with chanting, blessings, traditional string of firecrackers and, the big moment: a red dot is painted in the center of each dragon's eye ... ...this is for good luck and successful paddling and so on. Following the ceremony, there was a paddler's on the water clinic and a tiller's on the water clinic. I went. 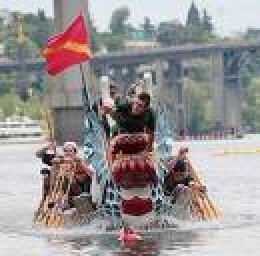 I have not been on a dragon boat since the Rose Festival Races last June. And I will admit that I was a little nervous. For those who don't remember (and why would you remember all the little details I posted last year?) or those who weren't following me - statistics are that, if or when a person from the dragon boat goes into the water, it is generally the tiller (the person standing up at the back of the boat) or the caller (the person standing at the front of the boat between the dragon's mane), or during a race, the flag catcher hanging over the nose of the boat is also a likely candidate. So, I was a little nervous. My goal for today was to not get wet; meaning that it wasn't raining (it didn't) and that I didn't fall in (I didn't). And I am now re-certified as the tiller for MissFit Dragons and re-freshed in being a tiller. I will also admit that it came back to me just like they say riding a bicycle comes back to you. I was glad I went out today, as the expert tiller did notice that I had my feet placed backwards, which would increase the likelihood of being knocked into the water by the till. But once I got my feet planted correctly and told the paddlers to push off, paddles up, take her away -- it came back to me. I remembered where to start my turn to get us out of the harbor, I remembered what to do when there was a tiny burst of wind and I felt my control slip a little (get the till out of the water, reposition myself and start again). I remembered where to say Paddlers Let it Run, hold the boat, ready to take her back. I parked almost flawlessly, although Clyde and I have a slightly different approach of whether to go a little behind where we're parking or a little ahead. It was beautiful. A beautiful day. A beautiful first return to being on the dragon boat. And I was on the boat with people I didn't know, other than Clyde and Carol Lee. So I met new paddlers and tillers. I met someone who knows someone on my team and saw us doing our workout on the Esplanade last Tuesday. And I met someone who invited me to be on her team after the Rose Festival races; her team is year 'round. I may do it in my team's off time; or may not. Now, at the beginning of the water part of the season, that sounds appealing. Sometimes I missed being on the boat - about a month after the Rose Festival Races were done; sometimes I was very grateful to get that time back and be able to do other things. But, no matter what decision I make, it was nice to be asked. I was told that I have a nice reach. I was asked to sit in the front, the lead paddler position (I know I have good timing - partly a result of early music training, I think - and that is important to being the lead). I also do really well at keeping in timing with other paddlers. Striking up the conversation with the tiller from another team is yet another example of the cameraderie of dragon boat people. Overall, we're a good lot - friendly, and willing to help each other out, and talk to people we don't know from other teams. I know there are some who keep to themselves and are highly competitive. But there are others of us who are all a part of this giant community and we get along - despite being on different teams. Don't get me wrong, we have our competitive sides, too, and want our individual teams to do well - and maybe I'm only drawn to the more community-oriented paddlers and tillers and callers. But it felt great. I must also say that I'm proud to be a part of the team I am. Our coach is great and she does a wonderful job getting us to be a team and to do our best, whatever that is. If we were to win, she wouldn't complain and we wouldn't complain. But she has us oriented toward doing our best and being fit. Winning is a bonus if it happens and we'd all smile and shout. But this is a great community and I sure felt at home on the water.